I love your hashtag- toddler wears prada. Haha, too cute! I bet she'd love a big girl room! Good idea with the birthday parties. And how fun, a 'bunny' room!! I fear for the day a kid asks for a 'themed' room/décor. I will definitely be figuring a way around it. Haha :) Yea for GREEN and St. Patty's Day (if only it meant we still got a spring break too)!! Her room is beautiful! And love th alternating birthday idea!!! Are you from Ireland?? I didn't know! What a beautiful room!! I like the idea of alternating years for parties. They are expensive and a lot of work :) I love your Irish mantle and can't wait to get out my St. Patrick's Day decorations ASAP. Awe big girl room!! Why do these littles grow so fast? It's such a joy yet you blink and it's like how on earth did that happen? I bet her room is going to look so cute! My 8 year old asked for a bunny theme for her birthday party on Saturday. Thank goodness all the Easter stuff is out!!! So excited to see her toddler room! I bet it is going to look AMAZING! 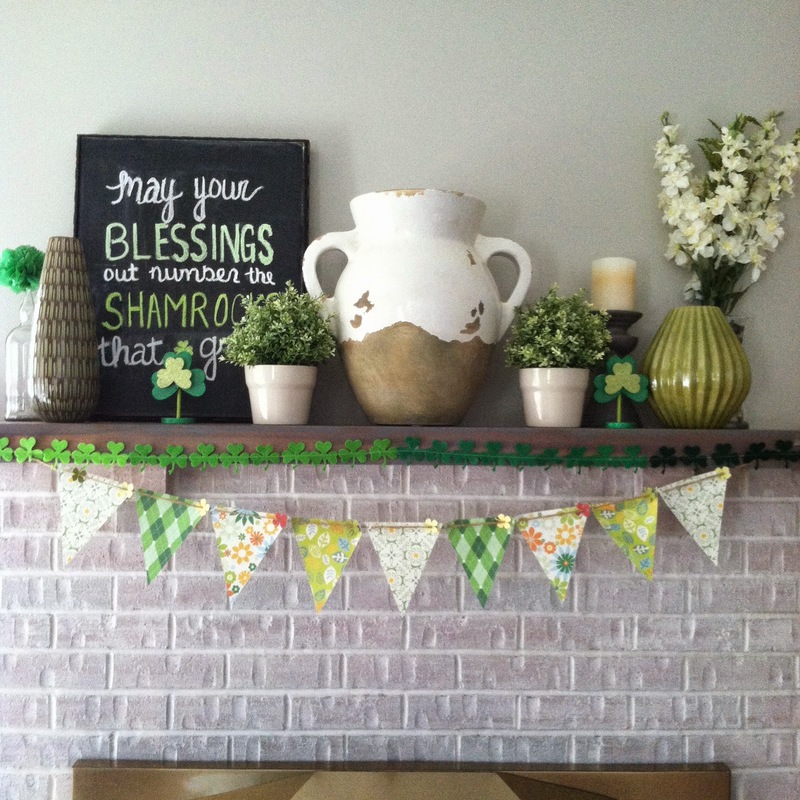 LOVE your mantle and love that you are so festive already for St. Patty's Day! Are you going to do that recipe exchange again this year? I loved the idea last year! Yes, it's so easy that she loves bunnies since her b-day is right around Easter too. Haven't even thought about St. Patty's posts yet really. I always decorate right after Valentines. I actually have a decent amount of St.Patty's stuff since we used to have parties, so I figure I might as well enjoy it. Aw, makes me sad that her room is changing and I have no idea why. I do love those curtains so much! Can't wait to see how the bunny room turns out. The bunny room sounds adorable! Love, love, love those curtains. They'd go perfectly in my daughter's nursery. We're planning on transitioning to a toddler room in the next 6 months, otherwise I would've jumped at the chance to buy them. I want a bunny room too! That sounds adorable. I'm sure whatever you come up with will be spectacular and I will be obsessed with it. :) You have such an eye for those things. I saw shamrock stuff out at a store yesterday and it made me think of you! I don't know what I'm going to do for St. Pat's this year - hopefully you'll be posting some of the fun stuff that you guys are doing. aw a bunny room will be precious! i definitely didn't give blair an option for her big girl room for the same reason you said...who wants to stare at elsa and anna all day?! Aw! I've loved seeing her room over the years in your pictures. It's so bright and happy :) Can't wait to see the bunny room!